The leggy actress also has undergone an image makeover with a changed hairstyle and spectacled looks. 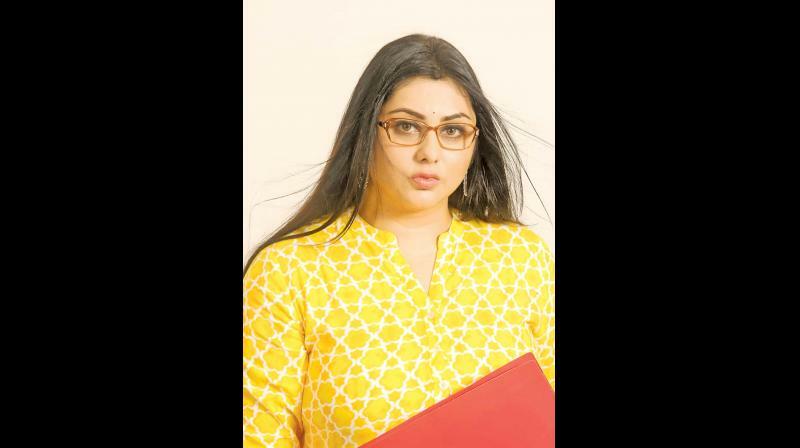 Namitha who took a sabbatical post her wedding with Veera returns to films after a gap with Agampaavam. The actress who has shed close to 10kilos for the role of a fiery journalist she essays in the film tells DC that she was waiting for the right script so long. Actor Vaarahi who also produces it in his home banner is penning the story. He also dons the powerful antagonist role in the movie. “The story is based on real life incidents and has a social relevance,” says Vaarahi. After a gap, Sree Mahesh of Chathrapathi fame wields the megaphone for the action thriller. The leggy actress also has undergone an image makeover with a changed hairstyle and spectacled looks. “There’s a 20 minute climax court scene which is the highlight of the film. I have lengthy dialogues and my director wants to shoot this on the first day. So, I took my lines in advance and rehearsed well and going with full preparation,” she adds.